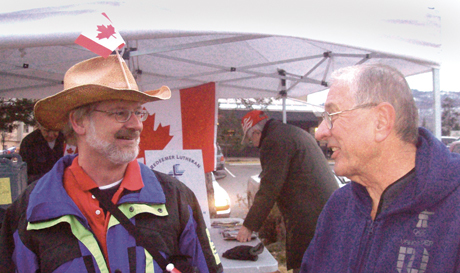 Pastor Jonathan Asmus (left) spoke to many people while waiting for the torch’s arrival. WESTBANK, B.C. At 4:30 p.m. Monday, January 25, the Olympic Torch arrived in the city and Redeemer Lutheran Church was ready! Members of the congregation set up a tent and offered free coffee and hot chocolate to the hundreds of people who came to cheer-on the Olympic Torch as it moved along the highway through Westbank on its way to Kelowna. Fred Voight served the hot chocolate, while Pastor Jonathan Asmus spoke to many people waiting anxiously for the torch’s arrival. As people talked excitedly about the coming torch, they received pamphlets and Olympic devotions. As the torch procession passed by, people cheered, shouted and waved energetically. The excitement of the Olympics was visible in the red and white clothing and waving Canadian flags and it provided an opportunity for members of Redeemer Lutheran Church to talk to people about the real joy in life—Jesus, and give them an invitation to join them for worship.